Intel has finally caught up with Apple with its new 64-bit Atom chips, which should be in Android smartphones and tablets starting as early as the second quarter this year. Intel is targeting the new dual-core Atom Z34XX chip called Merrifield at tablets and smartphones starting at about $250 and the quad-core Z35XX chip called Moorefield at more expensive high-performance mobile devices, said Julie Coppernoll, marketing director in Intels mobile and communications group. Besides longer battery life, mobile devices with the new chips will have better application and graphics performance than older Atom chips, Coppernoll said. Intel is expected to shed light on the new chips at the Mobile World Congress trade show in Barcelona this week, where a heavy focus on 64-bit mobile devices is expected. Smartphones and tablets with Merrifield will be first out of the gate with devices being announced in the second quarter. Mobile devices with Moorefield will come in the second half of this year. Without naming partners, Intel said many device makers have committed to using the chips. Foxconn, which manufactures the iPhone and iPad for Apple, will announce expanded use of the x86 architecture, Coppernoll said. The Merrifield chip will deliver 1.7 times improvement in single-threaded application performance and twice the graphics performance than a previous Atom chip code-named Clover Trail+ released last year, according to Intel. Mobile devices will be able to render high-definition video at up to 60 frames per second. The improved performance won’t sacrifice battery life. Intel has measured two days of battery life on a smartphone with Merrifield, though Coppernoll said that could change depending on the phone design. The urgency to release new chips came with growing interest in 64-bit Android, which will also bring performance improvements to mobile devices, Coppernoll said. Intel has finished development of 64-bit Android 4.4, paving the way for device makers to load the OS on handsets with the new chips. With 64-bit, there will be noticeable improvements in video performance, compression, decoding and other tasks that require a reasonable amount of processing, Coppernoll said. Handsets will also be able to pack more memory than 4GB, which could provide indirect performance improvements. Intel entered the smartphone market in the middle of 2012, but its chips are available only in a few handsets. The mobile device market is ruled by ARM, whose processor designs are used in most top smartphones and tablets. Intel fell behind in the 64-bit chip race when Apple’s A7 chip, based on the ARMv8 architecture, was introduced in the iPhone 5S. Qualcomm and other ARM chip makers have already announced 64-bit chips, but devices are not shipping yet. Intel is upgrading its smartphone chips at a faster pace than PC chips in an attempt to capture market share from ARM. The new Atom chips will be made on the advanced 22-nanometer manufacturing process, which will improve performance and power efficiency. Most ARM chips are made using the 28-nanometer process. The new Atom chips are based on the Silvermont core. The chips have a dedicated core for sharper video playback, noise reduction and better color on displays. The chip will enable hardware decoding of 1080p video, but the chip will only have software-based decoding of 4K video. The graphics core is based on PowerVR 6400 processor from Imagination Technologies. Mobile devices will also be able to track body movement and location with on-chip technologies. “Use your device to tailor your fitness program, find nearby shopping, play interactive games, and improve your shopping experience by interacting with retail signage,” Intel said in a data sheet on Merrifield. Another feature in the chips is support for Intel Wi-Di (Wireless Display), which should allow video to be streamed directly from mobile devices to TVs supporting the feature. Mobile devices will be able to have low-power DDR3 DRAM (LPDDR3) and USB 3.0 with on-chip support for the technologies. 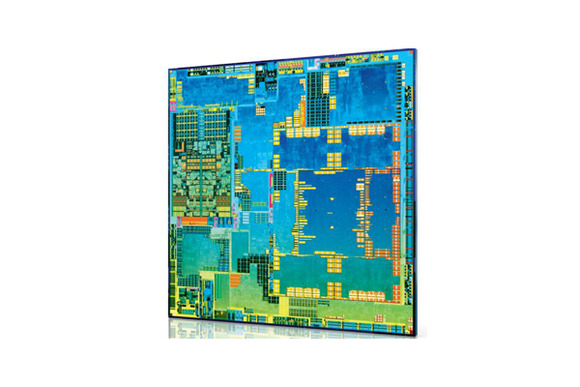 Intel hopes to pair the new Atom chips with a new XMM 7260 communications chip for LTE smartphones. The XMM communications chip supports LTE-Advanced, which is considered to be the successor to LTE. The communications chip also has support for TDD LTE, and TD-SCDMA, a 3G communications protocol developed for the China market.